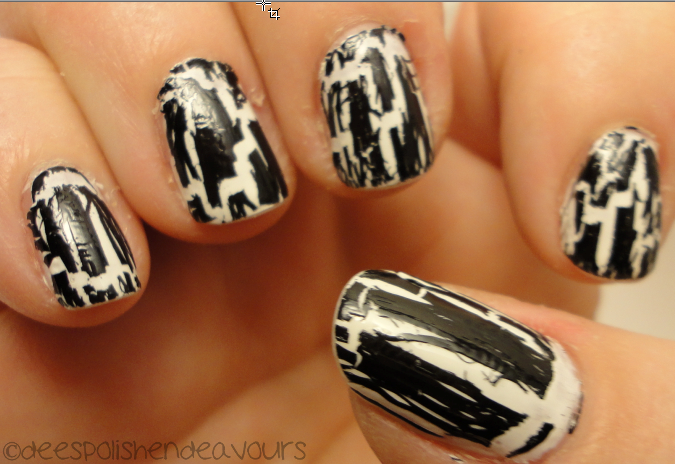 I am currently sporting OPI Alpine Snow with some OPI Black Shatter over top.. Which makes up my favourite combo (black and white!!) - BUT - I was just looking at the photos I took.. And.. My cuticles are extremely scary. I mentioned I have been really sick.. When I get sick (I assume this happens with a lot of people), my skin gets really dry.. Despite my best efforts (high H2O intake, lotions, etc) my skin is extremely dry. Especially my cuticles and surrounding nail area. I should just leave that alone.. Right? Wrong. I am a picker. I usually pick and peel my skin until I bleed. I don't even notice sometimes until I use the washroom or something and have to wash my hands.. Then, voila! Blood. Bad Dee!! I will give you a photo of something I wore last week. My mother and I were meeting up with a friend of hers (and her friend's daughter) to see a movie. I really do not like going out and not having my nails painted.. So I quickly applied this to my nails. I know I have an image with this look somewhere in my inspiration folder. Anyways.. I useddddd OPI A Grape Fit and CG Liquid Leather. And see? My cuticles and that weren't too bad.. You know what.. Because I like to run this here blog on honesty.. And want all of you to see when I make mistakes as well.. I will show you how scary my nails are. Both. Hands. You can still close the page..
Yikes! I really do apologize.. And I hope I don't lose a ton of followers for posting these ugly photos! Le sigh. In other news.. I returned home today.. And there is a little package waiting for moi. I believe it is nail gems.. So I will play with those some time.. AND! 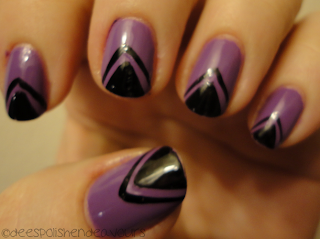 My best friend has given me 3 awesome nail art ideas lately. She BBMs me them.. And I quite like them! I am hoping that by next week I will actually have the energy to start doing some fun designs again. Seriously, this cold will be the death of me. Halifax - I know hey? Maybe one day we'll get some equality with the polish companies OR some amazing online shop will open that is Canadian and won't charge double for the polish alone. Ahh dreams - so nice, aren't they? Chantal - It is one of the worst feelings.. I agree with you there!! I love that purple mani! My cuticles are just as bad. maybe worse. I pick on the sides as well as the cuticles.